Senior Maguire Fitzgerald works a half nelson during a 3–0 victory over Boscobel's Chase Beinborn at 170 pounds in Fennimore's 57–21 victory last Friday night. POSTED December 20, 2018 11:53 a.m.
SPARTA — For the fourth year in a row, Fennimore squared off with Division 1 Sparta in a non-conference dual meet. Coach Chad Steldt’s third-ranked Golden Eagles won seven of the 11 contested matches and picked up forfeits at 120 and 170 pounds to earn a 49–27 victory. Fennimore is now 3–1 in its four head-to-head meeting with the Spartans. Junior Aidan Nutter opened the dual with a 14–5 major decision at 138. After three straight Sparta pins, Jaden Lathrop collected a forfeit at 170 to starter a string of five Fennimore victories. Senior Maguire Fitzgerald (182), junior Will Ahnen (195), junior Aaron Ragels (220) and senior Brayden Leffler (285) each recorded pins to give Fennimore a 34–18 advantage. Sophomore Brody Lee added a pin at 113, junior Luke Blair collected a forfeit at 120, and junior Alex Birchman closed out the dual with a 5–2 victory at 132. The Golden Eagles returned to action Friday night with a 57–21 SWAL dual meet victory at Boscobel. 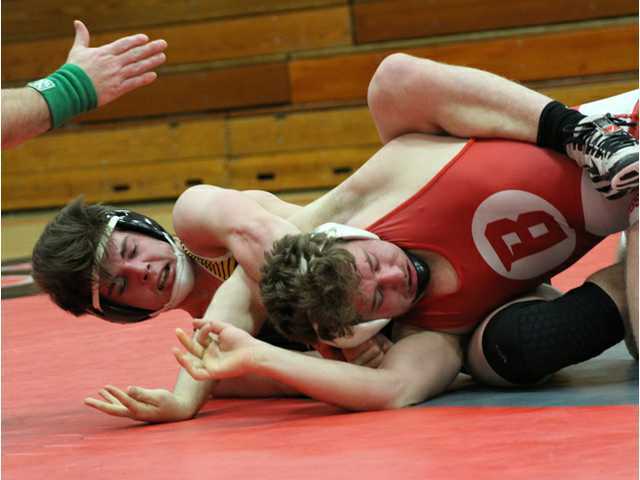 Junior Mason Lull (126), Birchman (132), senior Kohl Wardell (138), Trent Helms (152) each had pins and junior Mason Miles received a forfeit at 145 as Fennimore scored the dual’s first 30 points. Fitzgerald scored a 3–0 decision over Chase Beinborn at 170 in the match of the night. Ahnen (182) and Ragels (220) and Blair (120) also received forfeits for Fennimore, and senior Dylan Kehoe recorded a 17-second pin at 285. “We are hitting the flu season a little bit right now with six wrestlers out six, but this is a good time in the schedule to go through that,” said Steldt. “But other than that and a few minor injuries, everything is going to plan. We have to figure out our lower weights and our competition from 160 to 195 is tough so we have to figure out where everyone fits into the lineup. We all have to keep our number one goal in the room in mind, team wrestling and winning state titles, and everything will fall into place. Sometimes kids have to take a back seat for awhile but they know their number could be called at any time. That’s what’s so great about team wrestling. Everyone on the roster matters. NEXT: Fennimore (3–0, 2–0 SWAL) will travel to Iowa–Grant/Highland (5–3, 2–0) for another SWAL dual Friday night before competing in the Badger State Classic Saturday at the Alliant Energy Center in Madison. The Golden Eagles will then be off until Jan. 4 and the two-day Kaukauna Cheesehead Invitational. 138: Aidan Nutter (F) over Blake Brooks (S) (MD 14-5). 145: Thomas Treu (S) over Mason Miles (F) (Fall 3:05). 152: Tye Klass (S) over Trent Helms (F) (Fall 4:56). 160: Corbin Hauser (S) over Nick Blaschke (F) (Fall 1:44). 170: Jaden Lathrop (F) won by forfeit. 182: Maguire Fitzgerald (F) over Luke Wendorf (S) (Fall 3:18). 195: Will Ahnen (F) over Madden Connelly (S) (Fall 1:21). 220: Aaron Ragels (F) over Garet Pfaff (S) (Fall 4:42). 285: Brayden Leffler (F) over Noah Benish (S) (Fall 5:36). 106: Alex LeMoine (S) won by forfeit. 113: Brody Lee (F) over Luis Cruz-Cano (S) (Fall 1:17). 120: Luke Blair (F) won by forfeit. 126: Jon Bailey (S) over Mason Lull (F) (Dec 7-2). 132: Alex Birchman (F) over Vince Polhamus (S) (Dec 5-2). 126: Mason Lull (F) pinned Blake Sander (1:37). 132: Alex Birchman (F) pinned Braden Pickett (4:43). 138: Kohl Wardell (F) pinned Cooper Fitzgerald (1:00). 145: Mason Miles (F) won by forfeit. 152: Trent Helms (F) pinned Lane Waterman (3:00). 160: Tanner Basset (B) dec. Nick Blaschke (F) (6–1). 170: Maguire Fitzgerald (F) def. Chase Beinborn (B) (3–0). 182: Will Ahnen (F) won by forfeit. 195: Jacob Bray (B) Deonta Spurley (F) (1:30). 220: Aaron Ragels (F) won by forfeit. 285: Dylan Kehoe (F) pinned Kenny Foster (0:17). 106: Levi Glasbrenner (B) won by forfeit. 113: Ethan Hulce (B) won by forfeit. 120: Luke Blair (F) won by forfeit.